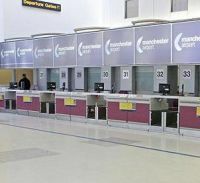 Airport operator BAA, part of the Spanish Ferrovial consortium, has confirmed that it will proceed with the sale of Stansted Airport after deciding not to challenge a UK Competition Commission ruling forcing it to sell. This is the culmination of a long drawn out battle between the regulators and the airport owners. "Having carefully considered the Court of Appeal's recent ruling, BAA has decided not to appeal to the Supreme Court and is now proceeding with the sale of Stansted airport", BAA said in a statement. 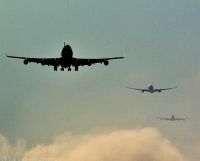 More Indian cities are beginning to attract the major international carriers. Cathay Pacific Airways will further extend its presence in the world’s largest democracy with four-times-weekly service between Hong Kong and Hyderabad, India’s fourth most populous conurbation and an important hub for the technology and pharmaceutical industries. The new service complements the airline’s existing passenger services to Chennai, Delhi and Mumbai and will further boost both leisure and business travel between Hong Kong and India. In a gesture to the future (there is nothing better than starting them at an early age) this year’s Goodwood Revival (14-16 September) will feature the youngest grid ever assembled. The inaugural Settrington Cup will feature a full field of 30 Austin J40 pedal cars competing in a two-part race on Saturday and Sunday, with the result declared on aggregate timing, and the prizes being presented by Sir Stirling Moss. Expect one of the most closely-contested races of the Revival weekend! 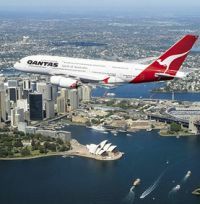 Australia's struggling flag carrier Qantas Airways has reported its first loss since privatisation in 1994, US$256m. The airline has also cancelled a firm order for 35 Boeing 787-9s, with the first due in 2014. In fact this is not as drastic as it would appear, Qantas bringing forward options on a further 50 aircraft, with the initial delivery set for 2016, in effect a two-year delay. Amsterdam looks like it will become United Airlines first international Boeing 787 route when the aircraft is introduced at Houston on 4 December 2012, on what the airline calls “a temporary basis”. The brand new aircraft will have initially flown on domestic routes but details have not yet been announced. 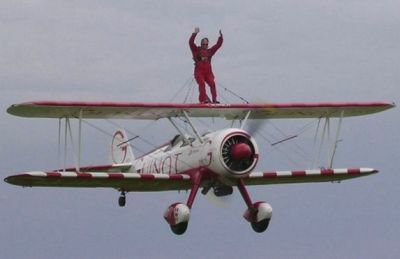 Happily known as the 'Mad Monk', Guinness Record Holder Michael Bartlett, a Brother of the Anglican Order ‘Oratory of the Good Shepherd’, has added to his amazing list flying with the agricultural spray company EPHuK of Razgrad (Bulgaria). Taking him in the air for a 20-minute flight was an Antonov 2 built in 1973. 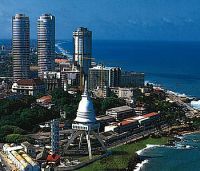 Colombo (Sri Lanka) is to return to the British Airways network after a break of 15 years. With Gatwick as the London airport, BA is to serve the island state with a three times weekly operation, an extension of its established flights to Male in the Maldives. Operating the route will be a Boeing 777 configured with 48 Club World seats, 24 World Traveller and 203 World Traveller. 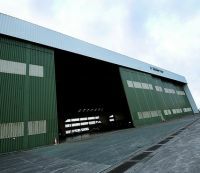 AIRBASE, the Coventry Airport ‘living aviation museum’ is to relocate to Newquay-Cornwall Airport at the end of September, within the brand new Aerohub Enterprise Zone. 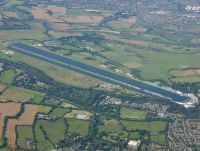 This follows publication by Sir Peter Rigby’s Patriot Aerospace Group of plans to develop Coventry Airport West, which it owns, and where the AIRBASE operation is presently sited. 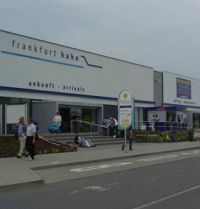 Germany's Hahn Airport, which was controversially renamed by Ryanair Hahn Frankfurt some years back seems to be in trouble. It is in fact 75 miles from Frankfurt International which in 2009 divested its interest for €1 to the federal state of Rhineland-Palatinate, who also took over the debt. The deadline for applications for Heathrow slots released as part of the European Commission’s approval of the purchase by IAG of bmi has ended. The 12 slot pairs will be made available for operations to commence in summer 2013. The slots available can only be used on Heathrow to Edinburgh, Aberdeen, Nice, Cairo, Riyadh and Moscow. 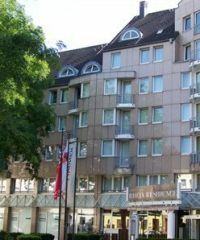 InterContinental Hotels Group’s (IHG) boutique hotel brand Hotel Indigo continues to grow in Germany, with the signing of Hotel Indigo Düsseldorf-Victoriaplatz. Earlier this year the Hotel Indigo Berlin-Centre Hardenbergstrasse became the first Berlin Indigo quickly followed by another property in the nearby Alexanderplatz. Airlines are always keen to tell their users, and the media, of new routes and promotions. By the same token, with some fine exceptions, they continue to drop destinations without a ‘by your leave’. There can be a number of reasons for the cessation of a service and BTNews will campaign vigorously for this kind of news information to be properly published. Platitudes (“we are sorry etc”) on their website are not sufficient. Manchester is to lose this autumn two of its daily connections to Belgium. 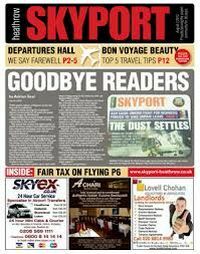 After 36 years, Skyport, Heathrow’s independent newspaper has folded. Current owner Trinity Mirror said that the tabloid was “not sustainable under current economic conditions”. Once again National Cruise Week looms up 15-23 September, a reminder that by the end of the year it is estimated 1.8m Brits, one-third of them newcomers, would have taken a waterborne holiday. It is the boom section of the leisure industry and that is not surprising. Where else, for often less than £100 per day, can you take a fully inclusive break including travel, accommodation, at least three fine meals, and entertainment? Three cruise shows follow, SECC Glasgow 6-7 October, NEC Birmingham 20-21 October, and finally next year Olympia London 23-24 March. 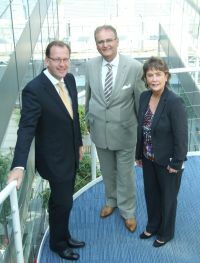 Biggin Hill Airport, which is in the London Borough of Bromley, handled a significantly higher profile of large corporate jets and some demanding peaks during the period of the London Games 2012 confirmed Robert Walters, Business Development Manager, in a post-Olympic de-brief to BTNews. Universally known as the DLR, London’s Docklands Light Railway has now celebrated 25 years. Opened by the Queen in August 1967, just before London City Airport, these were the two vital links required to make the “city in the east”, really take off. Just as the airport was built on the remains of an old wharf much of the railway was constructed over disused railway viaducts many dating from Victorian steam train times. PrivateFly, the private jet booking service, has come up with a new product based on the success of the London Olympics. 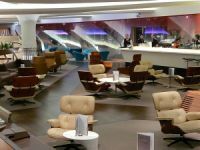 Aviapartner, the international ground handling service provider, has opened its first ever airport luxury lounge. 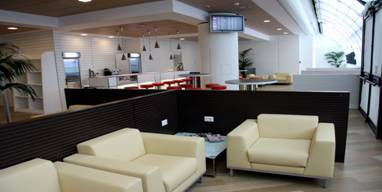 It is situated in Rome Fiumicino Terminal 3 second floor area D. The facility provides for a mix of tradition, with furniture made in Italy and a modern interior decoration that prefers natural lighting, soundproof rooms in a welcoming and exclusive environment. Following the announcement earlier in the year of a US$750 investment programme Abu Dhabi-based Rotana, which claims to be the leading hotel management company in the Middle East and Africa, is extending its Gulf portfolio with an additional nine properties by 2013. In direct competition with British Airways’ nine daily return flights, Virgin Atlantic will introduce a three times per day Heathrow – Manchester service next March, its first domestic routing. It has also applied for some of the slots BA has been forced to give up following the takeover of bmi. Should Virgin be successful it could quickly build up a strong regional presence including Aberdeen and Edinburgh. A wet leased Airbus 319 will be used but no more details are yet available.